Because of her history, they then tested her blood and found very low levels of the virus, the sort of levels you would see in patients that were about to recover. Every step that followed from that was precautionary. “We didn’t know what the trajectory was – if the virus in the blood was heralding the fact that something was going to happen or was it just what we would call incidental because we have never seen anything like this before, we were not sure what was going to happen whether this was going to turn into full blown Ebola virus and let’s be absolutely clear about this, it did not,” said Jacobs. Doctors at the Royal Free Hospital have confirmed that Pauline Cafferkeys condition improved significantly. At a press conference today Dr Michael Jacobs said that she is unwell with viral meningitis caused by her original Ebola infection. Pauline was first admitted to the high level isolation unit (HLIU) at the Royal Free Hospital in December 2014 after contracting the disease while working in Sierra Leone. She was discharged in January this year after making a recovery. On 8 October 2015 she was re-admitted to the HLIU after developing late complications from her Ebola infection. After careful consideration Pauline decided she would take the experimental drug GS-5734, which is an anti-viral drug. Gilead, which disclosed that it shipped doses of GS-5734 to the Royal Free Hospital in London last week following a request for compassionate access to the drug, noted that in animal studies, GS-5734 was associated with 100 percent survival in monkeys treated with the medicine three days after exposure to the Ebola virus. 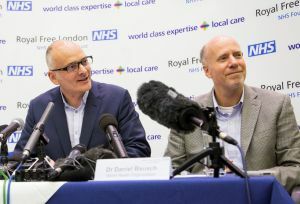 Both health care workers were treated by Michael Jacobs, PhD, an infectious diseases consultant at the Royal Free. Pooley received the experimental drug ZMapp. Cafferkey was reportedly treated with an alternative antiviral drug called ZMabb, because supplies of ZMapp had run out. Those who received ZMapp and survived are not reporting chronic or relapsing illness as far as I know. We are pleased to announce that Pauline Cafferkey was discharged from the care of the Royal Free Hospital on 11 November and has been transferred to Queen Elizabeth University Hospital in Glasgow. We are delighted that Pauline has made a full recovery from Ebola and is now well enough to return to Scotland. We would like to wish her well for the future. 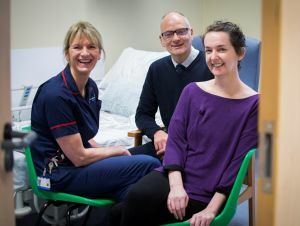 Pauline Cafferkey said: I am forever thankful for the amazing care I have received at the Royal Free Hospital. For a second time staff across many departments of the hospital have worked incredibly hard to help me recover and I will always be grateful to them and the NHS.